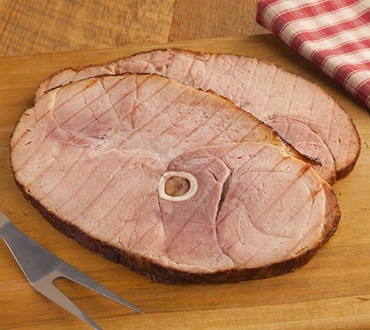 Our ham steaks capture the moist and lean flavor of our finest hams. They arrive fully cooked and are delicious warmed under the broiler, on the grill, or in a pan. The cob-smoked flavor and maple-curing are unmistakable. Each steak serves approximately two people. Excellent flavor and GREAT for a quick meal. First time buyer and I have enjoyed the ham for breakfast with hash browns and 2 eggs. Quick and easy meal. Also, great for dinner with vegetables. Very good taste! I usually sliced/diced it & ate it cold. Also, fried it. Been buying this for 50 years and it's still the best! One steak serves me for 2 or 3 breakfasts and one dinner.Reheats well in a microwave or toaster oven, but best is pan frying.